The new Late Show won’t premiere until September, but Stephen Colbert decided to get some practice hosting a TV show—something he has never done before, as that was a different Stephen Colbert on The Colbert Report—by stopping in Monroe, Michigan and guest-hosting an episode of its public access talk show Only In Monroe. Colbert sat down with usual hosts Michelle Baumann and Kaye Lani Rae Rafko Wilson, discussed local Monroe-area news, and interviewed a local rap musician named Marshall Mathers. 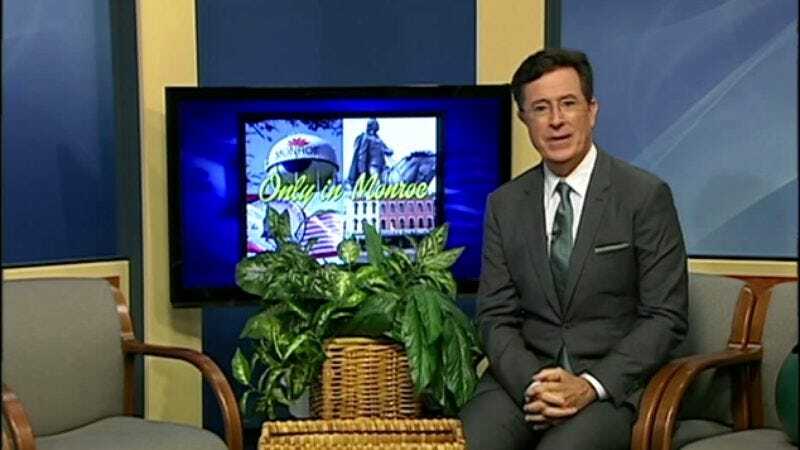 Not all of us are lucky enough to live in Monroe, Michigan, though, so Colbert has uploaded the entire 40-minute episode to his Late Show YouTube account. It’s wacky, it’s bizarre, and it’s all played weirdly straight, as if it’s totally normal that Colbert is guest-hosting a public-access show in a town that nobody has heard of. As funny as it all is, though, we’re just curious to hear the backstory of how and why this happened. Or maybe it’s better to not know, and we should just let this absurd piece of public-access history exist as the only evidence that it ever occurred.